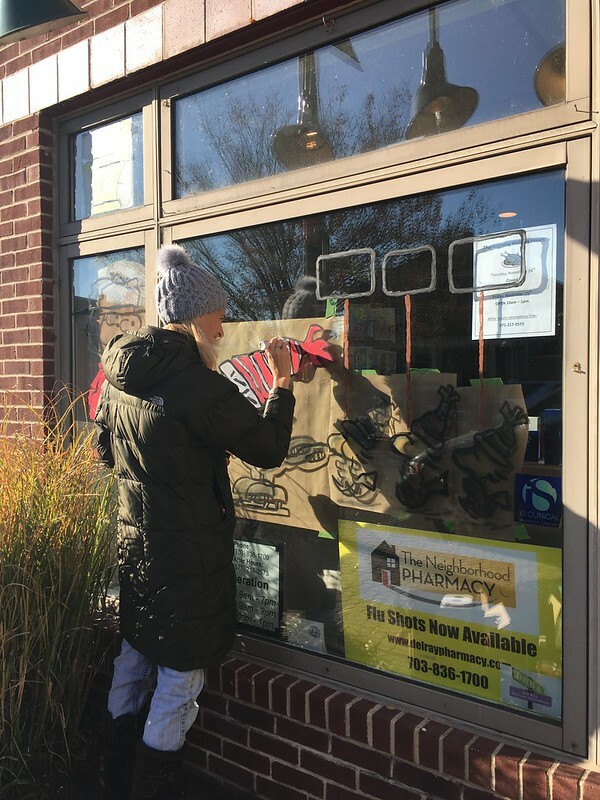 In the next few weeks, many of the businesses along Del Ray’s Mt Vernon Ave. will feature winter wonderland-themed murals on their windows. 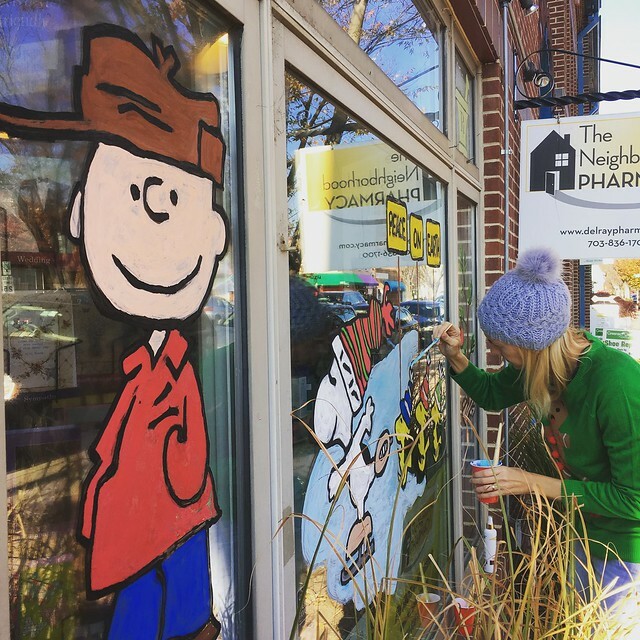 For the mural at Del Ray Pharmacy, my friend Candi and I offered to paint an ode to one of our favorite holiday stories, A Charlie Brown Christmas. Washable tempura paint and black tempura pen (not shown). Powder tempura paint. 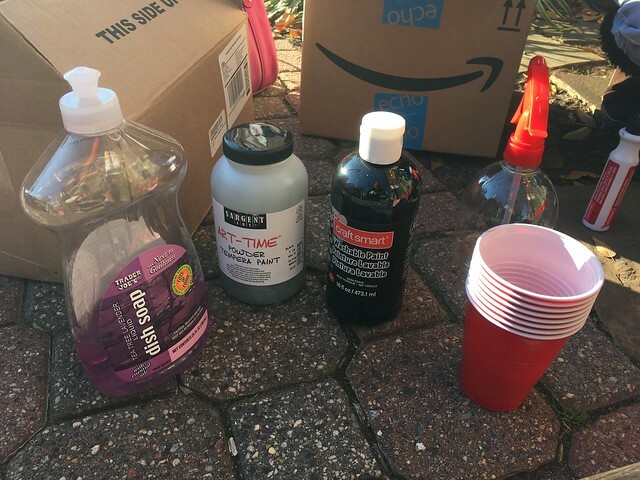 Adding about a tablespoon of powder to about a cup of the premixed paint makes the paint thicker to allow better saturation of color on the windows. Dish soap. One squirt in the mixture also helps the paint to stick to the window better. Paint brushes of various widths. Hair spray (not shown here). Spraying the final artwork will help protect it from the elements. 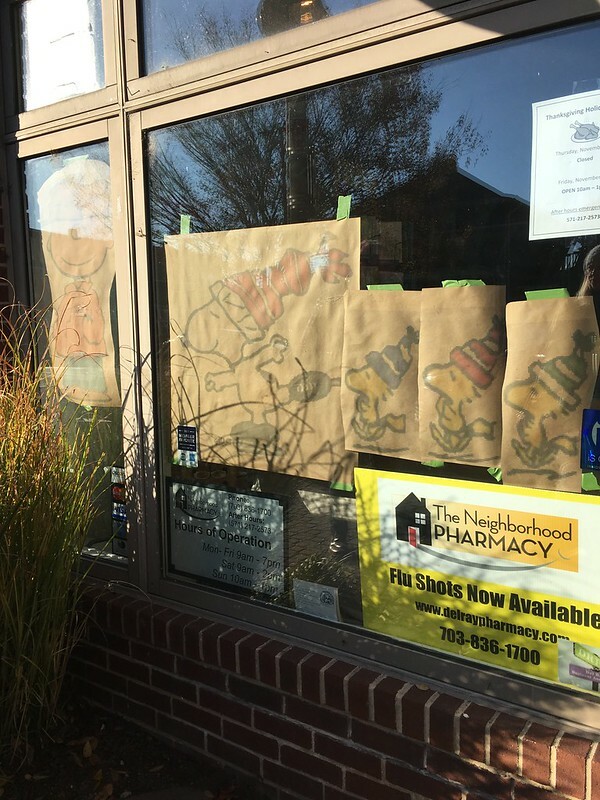 First, we found images online and had them enlarged in black and white (we got ours printed at Affordable Signs) to the actual size we would paint. 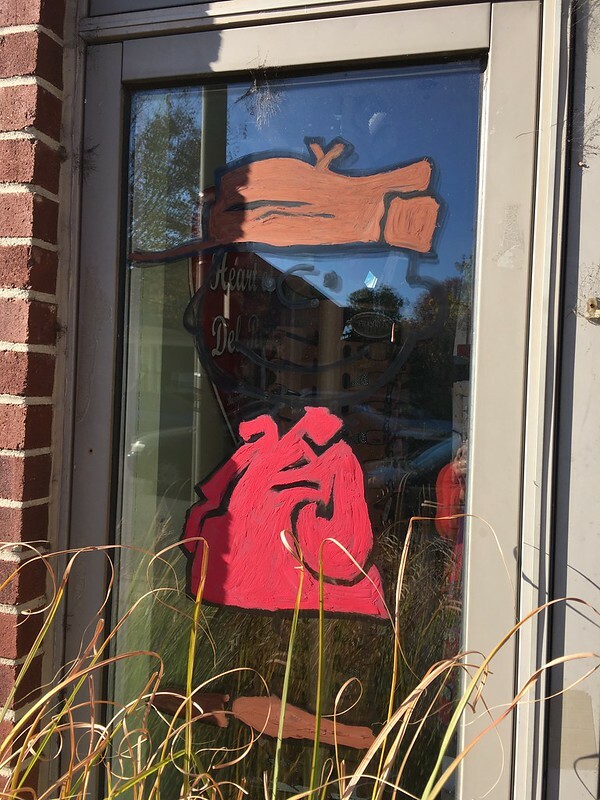 We then taped the images in place on the inside of the windows so we could trace the outlines. Candi started with the tempura pen and then I went over the lines with the black tempura paint to make them darker. Next, we removed the paper when we were getting too many shadows that made it hard to see the lines. We filled in the colors, working on each character, the tree, and the peace signs first before doing the pond in the background. 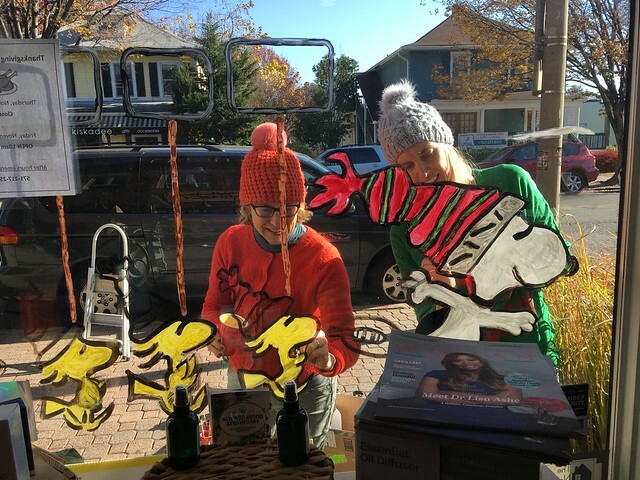 We gave it all a good coat of hair spray to keep everything intact and, we hope, impervious to the weather, especially for this Saturday’s annual Holiday Tree Lighting in Del Ray. 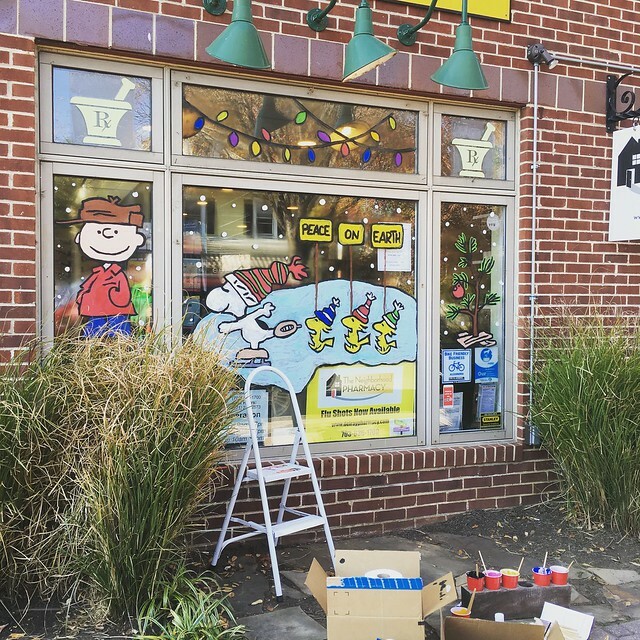 We hope you make it out to see this and many other hand-painted holiday windows this weekend or all month-long! OMG, can you come do my house??!! That is sooo awesome (or “cool” as Snoopy would say)!